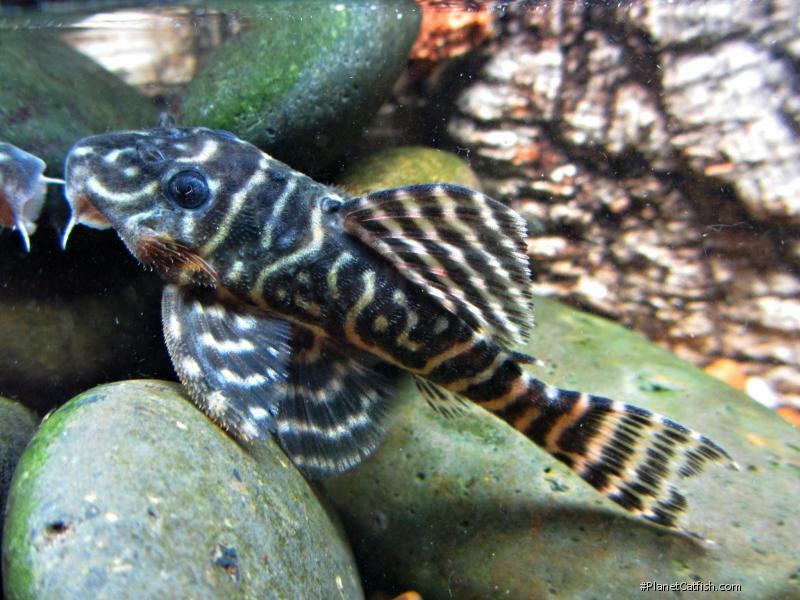 This month, Planet moderator, Yann Fulliquet introduces a pretty little pleco that is clearly a favourite of his. This Hypancistrus first appeared in 1995 in the January edition of the German magazine "Das Aquarium" which is now defunct. The fish was introduced as LDA19 and was known from three pictures taken by Erwin Schraml of a single specimen. Little further information regarding this species was known, just that it was found as a contaminant in a batch of Hypancistrus debiliterra, and reached maximum size is 8-10cm. The fish came from Venezuela. Due to these initial photographs, this Hypancistrus created a real buzz in the fishkeeping community, it is probably as sought after as other striking species such as Hypancistrus zebra, L236 and L250. However, because very few specimens were available, the price was very high and would prevent most, if not all, aquarists obtaining a single individual. So, for many years, almost no specimens were exported, just a few individuals, always as contaminants. Despite the l-number being often offered for sale on export lists, most of the time it would turn out to be Hypancistrus furunculus or H. debiliterra. In 2003, a group of specimens was exported again, Germany based Import Company Transfish was able to obtain this rare fish. It appeared that the species was coming from the Rio Tomo in the department of Meta, in Colombia. It is possible that the fish is seldom available because that region is under, more or less, guerilla control. This species is very variable in terms of body pattern. A few specimens are as beautiful as the one pictured by Erwin Schraml. The pattern can vary also a lot depending on the environment. If you keep this fish in a rather dark tank, the "orange" lines tend to get much thinner. When freshly imported, the lines are somewhat thicker. Some specimens are also not as orange coloured period. A rather beautiful colour morph of Hypancistrus debiliterra exists, which is very similar to Hypancistrus sp. L340, but not as orange coloured, the lines are light brown coloured, and it is easily misidentified as the so-called "Mega Clown". The head of this species is rather massive compared to the rest of the body; it is also not very high bodied. Both eyes are joined together by a light line, making the fish look like it's wearing glasses. The pattern is highly reticulated, but not as much as can be found on the species coming from the Rio Xingu. Lines are black to very dark brown and light orange / brown to orange. Keeping this species is not difficult. They are very hardy and adaptive to a various number of parameters. But soft water and temperature around 26-28°C is recommended. Like other Hypancistrus species they are not picky toward food, they are omnivorous with a preference for meaty food, specifically insect larva, but any commercial food will work as long as variety is provided. Breeding isn't too difficult either, as some spawning has occured in water with a medium hardness (Evers & Seidel). It appears the number of eggs are numerous, one can expect around 10-15 eggs per spawn, but I would assume a full grown female will lay around 20 eggs. The male guards the spawn in a cave. The egg is about 2-3mm big in diameter. And after 7-8 days the eggs hatched and it takes about 12 days for the fry to be free swimming. At this age the pattern isn't clearly defined. In terms of food, they will take about anything. I feed mine some crushed spirulina tablets and that is readily accepted. After a month they are about 1.5cm long, and pattern and colour start to look like the adult. Identification This species smaller size, the orange colour and the well marked eye junction is a good way to id this species. Can be confused with more strikingly marked Hypancistrus debiliterra. Distribution L340 was first found in the Tomo river basin, but a wider distribution is likely. Feeding Broadly omnivorous with a preference for meaty (insect based) foods. Furniture Rocks, driftwood, dead leaves with sand. Compatibility Generally peaceful but territorial towards other plecos of similar size. Breeding Can be bred in a large variety of water parameters, breeding isn’t hard to achieve, brood are of small size of around 10-15 eggs, male will guard the eggs and fry in the cave until they are free swimming. Female will breed one at a time like other Hypancistrus. There are 18 records of this fish being seen, view them all.